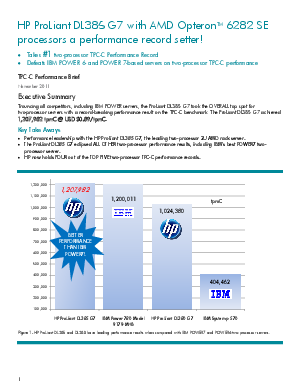 > PC Mall > HP ProLiant DL385 G7 with AMD Opteron 6282 SE processors a performance record setter! Trouncing all competitors, including IBM POWER servers, the ProLiant DL385 G7 took the OVERALL top spot for two-processor servers with a record-breaking performance result on the TPC-C benchmark. The ProLiant DL385 G7 achieved 1,207,982 tpmC @ USD $0.89/tpmC. The TPC-C benchmark simulates an Online Transaction Processing (OLTP) database environment. The performance of a system is measured when the system is tasked with processing numerous short business transactions concurrently. The TPC-C workload simulates a tiered environment wherein users interact with web pages to enter business transactions. Transactions are entered by simulated users, business logic and queuing of the transactions are handled by a middle tier server, and then the transactions are passed to the TPC-C database server for processing.